How to Find Movie and TV Filming / Shooting Locations? My friend and I are arguing over where the film Beach Blanket Bingo was filmed. She claims it was actually all filmed in Florida but I say that’s nonsense, it was filmed in Southern California. How can we settle this argument?? The question of where TV shows and movies are filmed is an interesting one, because production companies are expert at making one place look like another. We wouldn’t have any science fiction without it, right? I mean, we don’t yet have a colony on Mars or a deep space research station, let alone a city that looks exactly like ancient Rome for historical epics! Still, it’s surprisingly common how often one city will stand in for another. Because of the cost of filming on location, for example, Los Angeles has been a stand-in for just about every city in the world at this point. The official reference site for all entertainment media questions of this sort is the Internet Movie Database, IMDb.com. It’s a fantastic site that offers a crazy amount of information on millions of movies and tens of millions of TV and other episodic content, going back decades to the beginning of the industry. Because it has so much information, however, there is a bit of an art to learning how to navigate the info to find just what you want. Notice the numeric rating adjacent to the star. That’s always great info: The 1-10 scale rating based on IMDb user reviews (often tens of thousands or even millions of user ratings) and the overall rank of this film in the entire massive IMDb database of movies. This obviously begs the question of what are the top five movies on IMDb. They are: The Shawshank Redemption, The Godfather, The Dark Knight, The Godfather Part II and Pulp Fiction. How many of these have you seen? I know, stay on task and all that. I can’t help it, I love IMDb and browse around all the time learning about movies and television, along with other episodic programming from Hulu, Netflix, Amazon Video, and more. Did you realize the film had such a short running time? 89 minutes is a short feature film! Below that is the section you want, though: “Filming Locations“. The one that’s highlighted is the famous Sculptured House just a few miles from our office in Boulder, Colorado. Right below that is the golden link (alright, it’s not Willy Wonka!) “See more“. Click on that for the film and you’ll get a list of all known filming locations for the movie. Turns out you can continue to plummet down the rabbit hole by clicking on any of the entries. 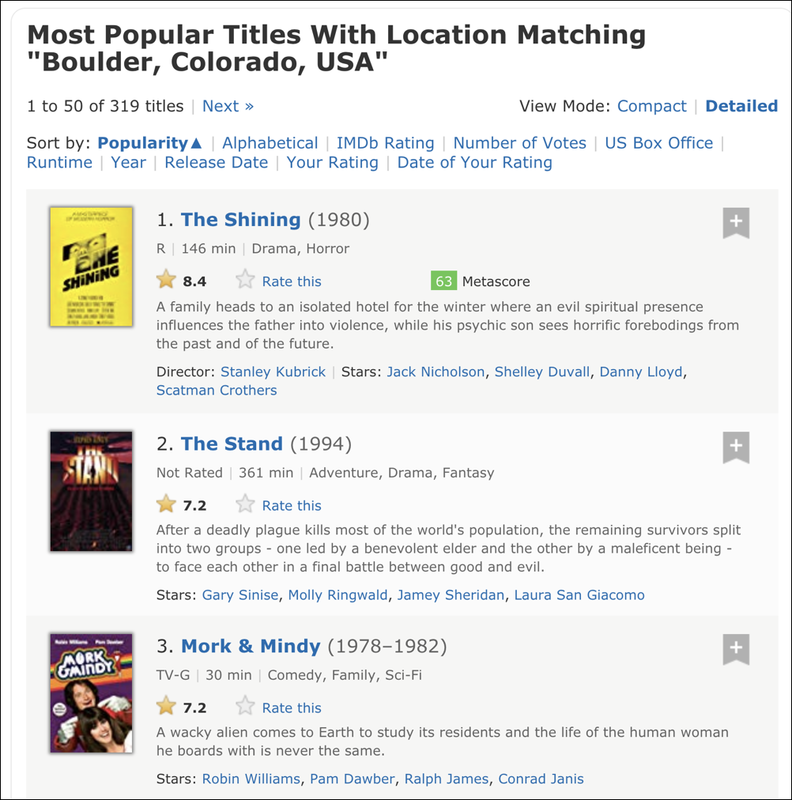 Apparently cheery little Boulder, Colorado is a popular place for horror films and it’s definitely famous for the TV series Mork & Mindy. But look at the total count near the top: 319 titles. That’s impressive. Can you feel the tension? The drama of the search? Scroll down a ways and…. Well look at that. Turns out that Beach Blanket Bingo was filmed at various locations in Malibu, California! THANKS, Dave, for always being informative and FUN !